Nobody put the kibosh on Rob Cesternino and Akiva Wienerkur this week as they recapped the next episode in the Seinfeld series. 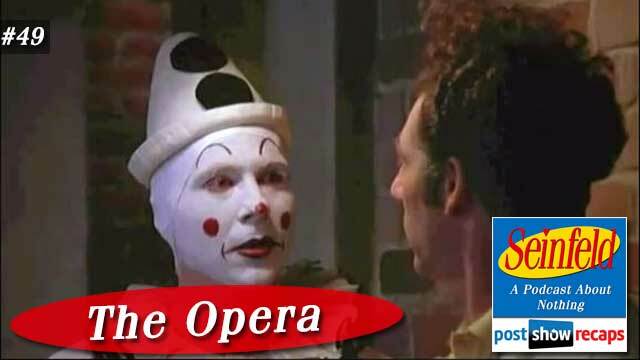 This week, they discussed “The Opera”, which first aired November 4th, 1992 as part of season four. There was big news in the Seinfeld world this week. Hulu bought the digital rights to the series for an astounding $180 million. Akiva thought that this could really bring the show to a wider international audience. Rob mentioned this will help listeners to watch the episode they’re covering each week with ease. In more news, Jerry made his final appearance on his good buddy David Letterman’s Late Show. Jason Alexander was on The Late Late Show, where he recorded a version of his famous outgoing message of “Believe it or Not” for Kat Dennings from Two Broke Girls. shut up Akiva” is in reference to when either of them get a little too nitpicky on the storyline). Jerry and Kramer come into Jerry’s apartment talking about the opera they are all going to, but Jerry is trying to get out of it. Elaine shows up to get the tickets, explaining she is going to surprise Joey with them. She refers to Joey as quite cultured, and the scene cut to Crazy Joe lifting waits while sobbing and blasting opera music. Rob shared that he agrees that the “pop in” is a terrible thing, but maybe not for Joe since he encourages intruders. Jerry finally listens to the threatening answering machine message and frantically asks Kramer what he should do, who says not to bother calling the cops. Akiva and Rob pointed out another example of the show disparaging law enforcement. Jerry calls Joe Devola back, leaving a message trying to explain that it is all one big misunderstanding. There was an interlude where Rob and Akiva planned and acted out fictitious interviews with Jerry and Larry. In actuality, Rob does believe that getting a guest like Susan, Crazy Joe Devola, or the like could be a possibility. Years ago, he had met the actor who plays The Soup Nazi at a Seinfeld related event, and he seemed to be accessible. The next scene cuts to Joe Devola’s apartment as Elaine is coming for her surprise pop in. His door was wide open, so she walks in and discovers dozens of photos of her hanging on the wall. Devola surprises her as he ducks out of his dark room, explaining that he took the photos himself with a telephoto lens. When she explains that the opera tickets fell through, he slams the front door shut with his head. Elaine worms her way out of the situation by spraying him in the face with cherry binaca from her purse. Rob thought it would have been funnier if the viewers knew it was binaca when she did it, because it seemed dark for her to mace him. In the next scene, Jerry is in his tuxedo talking on the phone with the police about Joe Devola’s threatening message, learning that they can’t do anything for him. George shows up, and his tux is way too small, having dusted it off from a wedding he wore it to six years ago where he was thrown out for cursing during his toast. Kramer hits his head again attempting to come into the apartment, since Jerry had the door locked to keep out Crazy Joe Devola. He is not dressed in black tie, instead going with a 1950s Ozzie Nelson look. He explained to Jerry and George that people dress up for the opera, just not him. Kramer mentions to George that they can scalp the extra tickets since Susan isn’t going with, much to the delight of George’s cheap ears. Later, Jerry and Elaine are waiting in the line to get into Pagliacci, and Jerry gets in an argument with a man who takes his quarter that he dropped. Rob once again mentioned that he prefers scenes like this, that are actually about nothing, opposed to the life and death storyline of Devola trying to kill them. The scene cuts to Crazy Joe Devola in full clown gear, taking down three thugs in the park for teasing him. Back to the opera line, George and Kramer are taking a $500 offer for the two tickets, but Kramer wants $1000. George decides to sell his extra ticket on his own after Kramer refused to take the $500. Back with Jerry and Elaine, Jerry mentions Crazy Joe Devola, to which Elaine wonders how Jerry knew her new boyfriend’s name. They both discover that Elaine had been dating the psychopath after Jerry all along and didn’t know it. A clown walks up to them, scaring them, but it wasn’t Devola. Meanwhile George and Kramer are separately trying to scalp their tickets. George is negotiating with a man he’ll call Harry Fong, when Mr. Reichman, the same man who wrestled him out of the wedding for the curse toast, accosts him for scalping. The clown who approached Jerry and Elaine was asking for a donation, and lectures him after Jerry says he has no money. Kramer is on his own trying to unload the ticket when Crazy Joe Devola walks up in his clown outfit. He and Kramer have an awkward exchange, ending with Devola buying the extra ticket from him. Jerry and Elaine are impatiently wondering where George and Kramer are, worried that they’ll miss the overture. Jerry starts singing the overture routine from Bugs Bunny, while Elaine scoffs at him. Right after, Crazy Joe Devola walks up, looking just like the clown from before, but Elaine smells cherry binaca, and they run off. As George is closing his deal with Harry Fong, Susan shows up, since her friend didn’t need to be picked up after all. George still hands off the ticket to Harry Fong and takes the money. The scene cuts back to Jerry and Elaine, who are trying to get let into the lobby without the tickets. Kramer finally shows up and they all head in. When the settle into the seats, Susan sits down, sharing that George was too uncomfortable, and not coming. Harry Fong then sits down, shifting the whole row of seats as he does. Rob and Akiva mention that the closing standup was not worth discussing. Both Rob and Akiva agreed that this should be the lowest ranked episode of season four. Akiva thought it was funny, but because of all the plot holes, he put it at 143. If not for the inaccuracies and the dark tone, it could be ranked far better. In 2015, Kramer and George could just scalp the tickets online, and Jerry and Elaine would have learned ahead of time that they are dealing with the same Joe. They delved into the emails next. Johnny De Silveira put the opera tickets at $168.30 in 2015 after running it through the inflation calculator. He also noted that tickets to the Met (Metropolitan Opera House) run from $105-$360. He also wanted to know if they’d like to podcast from Crazy Joe Devola’s darkroom, to which Rob sarcastically said yes. Amir emailed in to share that he felt the CDJ storyline would have had more depth to it were it in one of the later episodes in the series. Both Rob and Akiva agreed. Lastly, Chester wondered how Elaine didn’t need to be buzzed up to Devola’s apartment, and further wondered how she even had his address. Akiva pointed out that there are plenty of apartments in Manhattan that don’t have front entrance locks, but had no idea how she came up with his address. He also wondered how CDJ could put on the act on three dates with Elaine without cracking. Rob and Akiva thought because he’s a sociopath, he was able to put on a front. Finally, he wanted to know how George grew three inches in his thirties, and would wear white socks with the tux. Neither of the guys had a good answer for that one. Tune in next week as the guys will recap “The Virgin”. Send in your questions by emailing [email protected]ps.com . Don’t forget to subscribe to the podcast by going to postshowrecaps.com/seinfeldITunes where you can rate and review the podcast. And as always, you can follow them on twitter @robcesternino and @keev26.